· The one listed in the Abbot Bianchi documents, existing in 1274 and destroyed in 1295. From the set of existing walls you can see that the building is elevated three floors until you reach the height of the walking surface of the underground church. On the wall up in the cliff you can see the holes that line the beams supporting the floor of the rooms. The entrance to the castle had to be through a wooden retractable staircase that linked the stone staircase at the entrance. This can be deduced from the fact that today's steps meet the threshold of a door. In the fort still it exists an oven that gives us an indication of the fact that the place was inhabited permanently. At this strategic site you can only be given a military character or function of refuge for the inhabitants of neighboring countries during the invasions that have occurred over the centuries on this territory. Cave was the last refuge from invasions. This can also be deduced from the legend passed down the besieged queen in the cave, identified by different authors, sometimes of Slavic ancestry (Vida) and Lombard (Theodolinda) opposed to Attila king of the Hungarians. This queen, throwing off the cliff on the attackers plenty of grain (the last one) said, we have so many sacks of grain as there are grains of this. The intent was to make the enemy believe the presence of a large amount of supplies, such as to prevent the conquest of the castle by starvation. The ruse worked, the enemies rose up the siege and the defenders were able to leave the cave and back to the countries. In the first part of the cave we have been obtained an underground church and a side chapel. The latter comes to us with the gothic setting of 'last restoration in 1477. 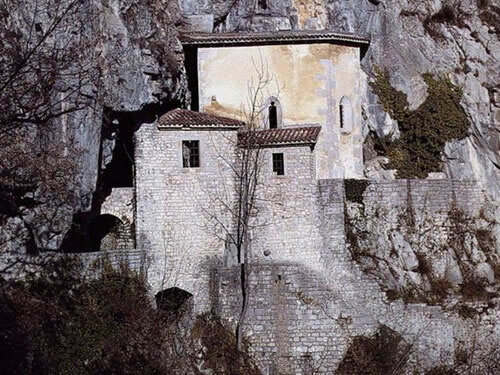 The floor of the present church stone slabs is supported by a stone cryptoporticus, extraordinary construction that allowed the use of the cave avoiding the flooding of the underground river. 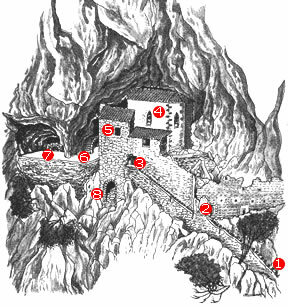 The classroom, formed laterally from the rock walls, has a length of sixteen meters and a width of ten. On the walls shows a flower with six petals inscribed in a circle. This symbol, along with a cross with equal arms and a face of Christ is the only presence in the frescoed church. The wooden altar dates from the seventeenth century. In the side chapel on the south wall, it is arranged a tombstone buried cheindica the name, the name of the church and other useful references. to 'identification of the primitive placement. Previously, the plaque acted as a sill at an arched window. Probably this was not the original site as the words quoted in the epigraph: ... TUMULATUS ... AD FUNDAMENTA ... suggest or to the church floor or the foundations of the ancient wall of the chapel which rest on the rock, a floor below the current floor, the entrance of the complex. Another indication of this location makes we can infer from the epigraph where men are cited ASCENDENTES ET DESCENDENTES ... to which the buried asks to pray for his sins: this confirms the attendance of the church and the stone arrangement in a tomb place visited by those who entered. The incision Iaceo indignus HIC TUMULATUS EGO FELIX ... (Happy I have shamefully buried ...) it leads us to identify this character with the deacon Felix mentioned in a donation of King Berenger the 888. With this document the king grants to religious the church of St. John in the cave and the part of the Natisone valley (from S.Quirino bridge Stupizza). The inscription of the plaque also indicates the 'name of the church ECCLAE IOHIS BAPTISTAE AC EVANGELlSTE, bringing us back to a foundation of the same to the Lombards hand. The site also had to have for the Lombards strategic function since, echoing the Roman defense line, was an outpost of Forum Julii (Cividale). · The sun opposed the moon and the stars. · A figure with hands clasped in prayer.